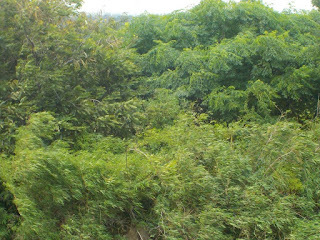 The dusty landscape becomes darkl green connected with clear dark brown lines. Tar roads shining black with green borders, leading ahead with every turn. The gushing water in the stream like veins, gives a much needed adrenaline rush to the farmers, waking them from their slumber of lazy summer afternoons. Shoving them in rickety, wet, overcrowded jeeps which take them to the dirty towns to look for cash loans, seeds, fertilizers, ropes. Back home, a plough has to be repaired. The leaking roof has to be mended. The rain facing wall is to be repaired. The list is never ending. To this hectic schedule another ‘to do’ topic has been added on the list of more ambitious Barela adivasis - looking for schools, hostels to ‘put’ the children. The bad breath of the year, washed off and forgotten. Hey, let’s start afresh! Monsoons, in fact, are a very good time to start. Like every year a meeting of parents seeking admissions was held on 25th June. 24 new children were admitted taking the total strength to 123. This year the proportion of girls was better than last year – almost 20%. All of these are adivasi children. 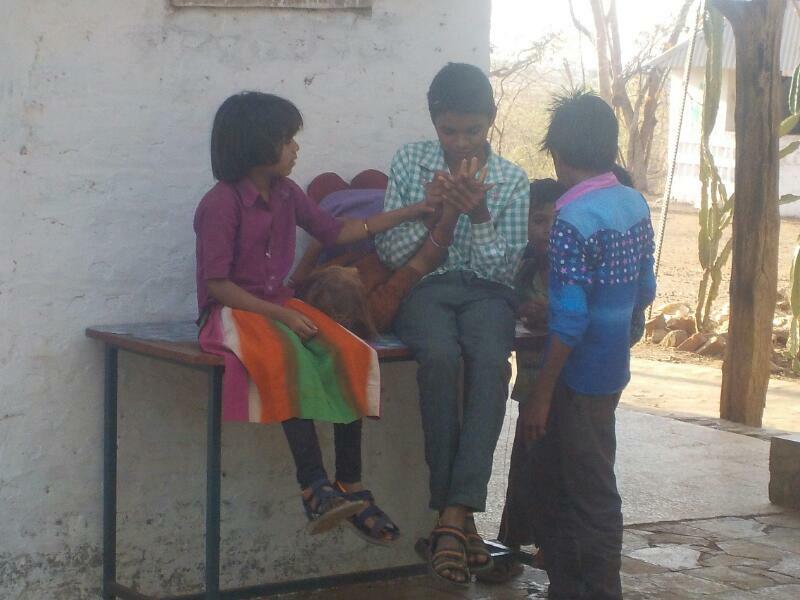 Three children from the slums of Bhopal also took admission but went back soon after. One homeless child from Indore is still with us. He has jelled completely with the local children here. The first fifteen days were spent in making the newcomers comfortable. They learn the ways of Adharshila through teachers, meetings and senior students. They tag with seniors from their villages or relatives. The first month is hectic for us too. We have to get the school and teachers back into gear. In the summer vacations we have all become different persons. We have to re-member ourselves. Or is it vice-versa? Teams of students and teachers divide tasks to set up the school - cleaning, finding charts, books, games. Putting things in place. Making the monthly schedule. Working on the farm. A team of Karyakartas is made from the middle school children to take responsibilities of the various aspects of the school work. From the mess, TV, animals, cleaning…. there are karyakartas for as many as 15 tasks. The Karyakarta team works with the teachers to run the school. Planting trees, consolidating the green fence of the open campus. Making the mess functional. For us personally this was a very trying year. It was one of those nasty years, which becomes a special chapter in a biography. At the time when all this action was happening; our minds and bodies were totally engrossed in pouring over the net to research some weird disease which had befallen on someone very close. Meeting doctors. Ayurveda treatment or not? How long. Tantrums. Depression. Why us? We were lucky to have good friends and family which helped us tide over this very difficult and emotionally sapping time. It was also a learning experience which started by Ayurveda challenging all the urban middle class notions of nutrition and health. This was the most difficult part. There is extremism even in health systems. It is surprising that we couldn’t find a single allopathic practitioner who was willing to incorporate the learnings of natural healing/ Ayurveda. 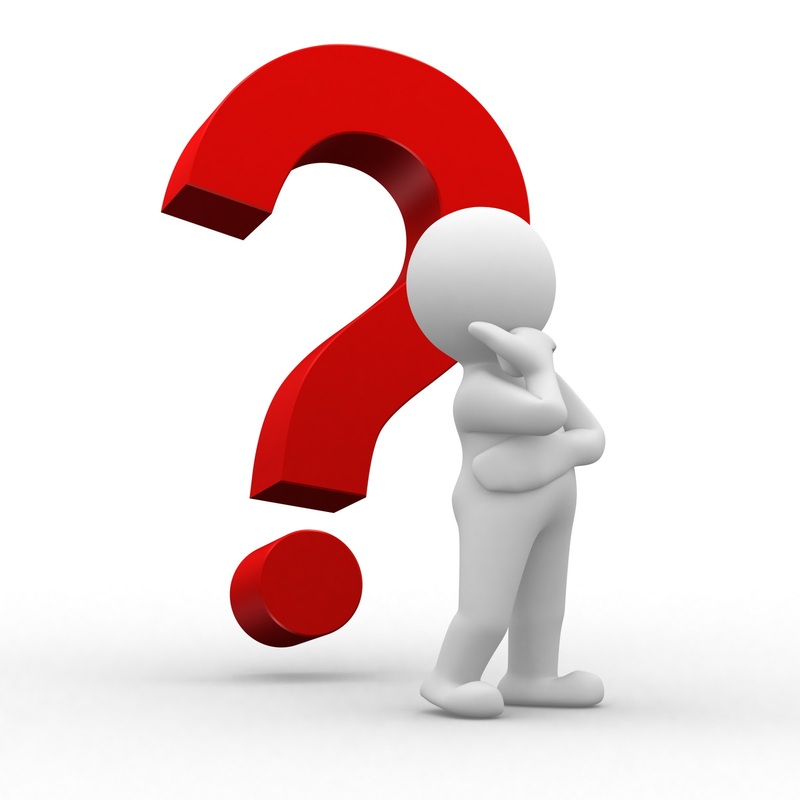 Although ‘nutrition,’ sounds such a mainstream health concept, it has absolutely no space in the allopathic treatment. Surprisingly, lot of American doctors are recommending, body cleansing, diet control, yoga and meditation, lifted straight from Indian health systems. 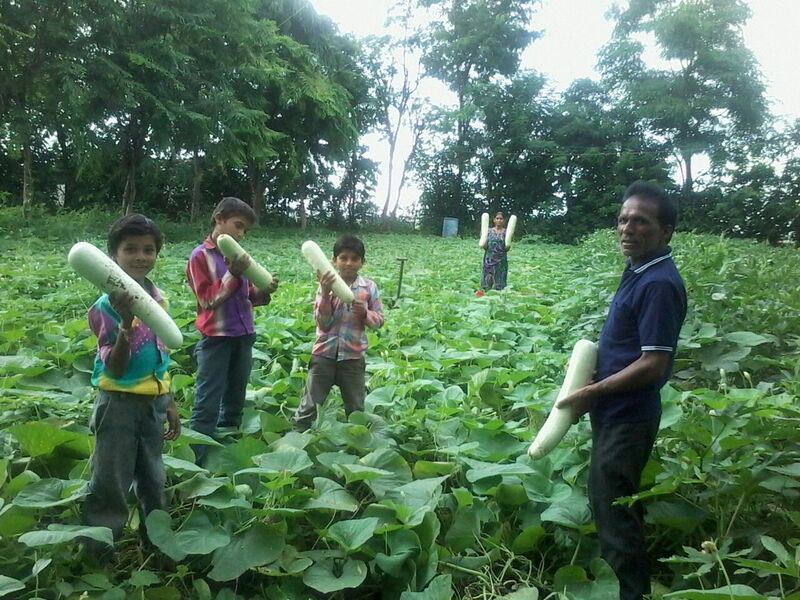 It’s a tradition at Adharshila that all children work on the farm. The work is allotted according to their age. While the elder 7th – 8th class boys help the teachers in ploughing with bullocks which were trained by the slightly younger lot. Yes the bullocks have to be trained at a particular age. If not trained at the right time they become lazy. This is a fun job for the boys who make a wooden ghisra to sit on while the bullocks run on the road. They help in watering whenever there is electricity, carrying the manure to the field, weeding, mulching, plucking vegetables, weighing, writing everything. 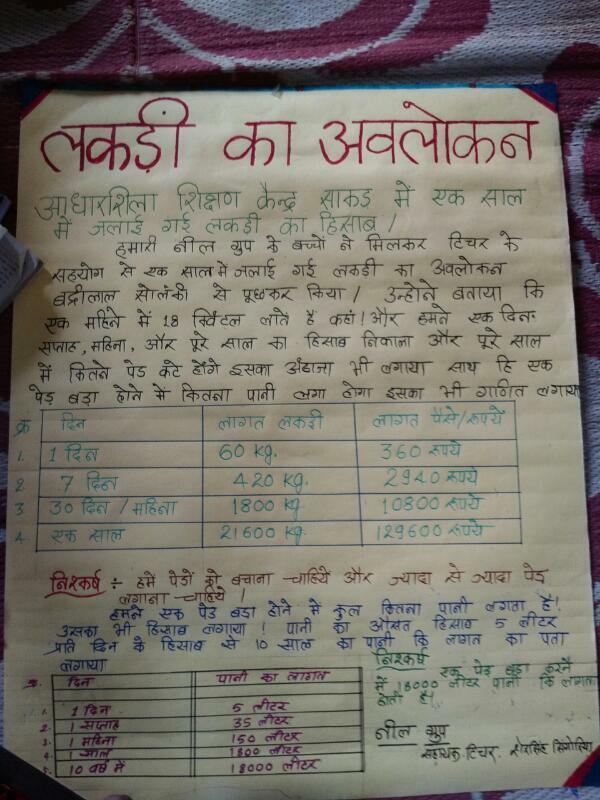 In the end they calculate the per guntha yield of each vegetable. 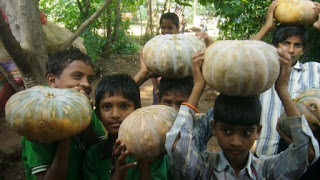 In the process they learn to make Jeevamrut, pesticide from leaves and organic growth promoters. They learn that lot of weeds are edible and we should leave them in the field to be used in the kitchen later. Most importantly they learn that things grow without bringing in chemical fertilizers and poisonous pesticides from the market. And the sheer joy of harvesting basketfuls of vegetables is unforgettable. This year besides vegetables we left two plots for fodder for the animals. Our cow gave birth to a she-calf. Thanks to her the children got to eat khaato, a source of lactobacillus, all year round, made of curd from about 210 litres of milk and urine to feed the soil bacteria. The children and teachers ate more than 40 quintal vegetables - gourds, tomato, pumpkin, ladyfinger, various types of beans, brinjal, spinach and fenugreek. Besides this we got pulses to last for about 2 months. The smaller children invariably make their own small plots of bhindi, brinjal, tomatoes and methi. They just like to sit there, water the plants, put a drip and keep doing something. One of our aims was to create a residential school model which is Sustainable on its own as far as possible. This year we spent much less on milk and vegetables. In terms of cash it would mean a saving of at least Rs. 50,000/- . This year about 200 plants of trees and bushes were planted. Hopefully they will be cared for. This was done on Independence Day with involvement of parents and college students mobilised by Adivasi Chhaatra Sangathan. Tree planting of late is becoming a ritual. It needs to be taken seriously and done systematically. One thing which we were not able to do is to make a new tree plot for fuel wood. During the term end holidays at least 40 children planted about 500 trees in their villages but on a rough estimate about 140 are still going strong. Aloe Vera was planted to re-enforce the already existing Green fence. More work needs to be done on the fence. Teachers and the 8th class children dug trenches on the border of the farm to catch rain water and planted thorny plants on the bunds. 8 - 10 trenches - 8'x 3' x 2' - were dug during the morning shramdaan time. The Middle school children also learnt to make contour line using an A-frame. Making the farm furrows along the contour lines is also a very nice way to stop water from flowing out of the field. Why should children be made to do work of adults? A question came up on face book about making the children do adult work. Some urban people are not comfortable with the idea of children being made to work in a school. A lot of people have grown up thinking that education and schooling are synonymous and the only link of children and work they can think of is child labour. We are very clear about this from the very beginning. Work constitutes an important part of our lives. 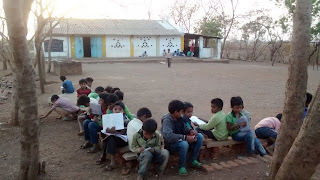 This is a residential school where children have to do all their personal work like washing clothes and take part in community work like keeping the campus clean, helping in cooking, taking care of trees, grazing the animals, helping on the farm and teaching, maintaining the library....There is no shame in doing physical work. All the children belong to households whose parents, grandparents, brothers and sisters are engaged in hard physical work to earn a living. When we go by urban society’s value of looking down on physical work we learn to look down on our parents. And the only path of emancipation we see is to get out of this world of physical labour. In fact to neutralise the low value given to physical work by society, at times we glorify it. In a sense it is true also. Everything we desire or consume is the result of someone’s labour. There are values attached to physical work – dignity of labour. There is this issue of the inequality of payment for physical and intellectual work. There is a very different attitude towards work as far as farming communities and urban middle class is concerned. The discourse on work has to be rethought. A child being forced into work due to poverty is something which has to be fought tooth and nail. But this should not translate into not making children do any physical work except workouts in gyms. The challenge is that all that is needed to be done should be done by personal initiative. This is only possible if their is a feeling of attachment with the place and a sense of ownership and this doesn't come easy. Now that the planning is done and the farm, animals and other things have been taken care of let’s get to the schooling part. This year we had 11 adults to look after the 125 children divided into 9 groups from 1st to 8th class and one extra group of children who have joined after passing 5th or higher class from other schools. This group works like a bridge course. The 1st to 5th groups are based on their official class but their level is taken into account and their groups are changed after 6 months if needed. The Teachers – Like most schools of the country, getting energetic and committed teachers, who also know the subject, is the biggest problem. Though we have MA and MSc, BSc teachers but their subject knowledge is not up to the mark. Also one needs to put in a lot of effort to help children learn. Mostly for committed teachers, sharing of experience is the best way to learn, how to teach. To improve their subject knowledge, like every year Dinesh and Shersingh attended a one week middle school science teacher training programme conducted by the NGO, Eklavya in Hoshangabad. ?? We wonder how they can become facilitators, mentors and not just subject teachers?? We tried to motivate the teachers to take initiative and do some activities. But many more miles to go on this road. Evening discussion was organized with middle school children on social issues such as changes in the traditional marriage system, unemployment, crises in farming. 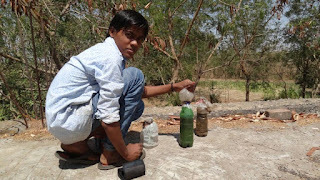 Shersingh, who is also an ex student, formed a youth group in his village, Jhiri Jaamli. The group meets once in a month to discuss the village problems and ways of improvement. This group has stopped sale of liquor and gambling. During the process the group even had a tiff with the police as they had taken bribes from shop owners. The group was successful in getting the money back from the police. One teacher participated actively in general knowledge competition organized by a local adivasi Sangathan, about 120 children participated. Teacher was in charge of collecting questions and conducting the exam in one centre. Like everywhere the children are much more lively and enthusiastic than the adults. At Adharshila, besides studying the text books, children do a lot of activities like making toys, observing nature, collecting things. 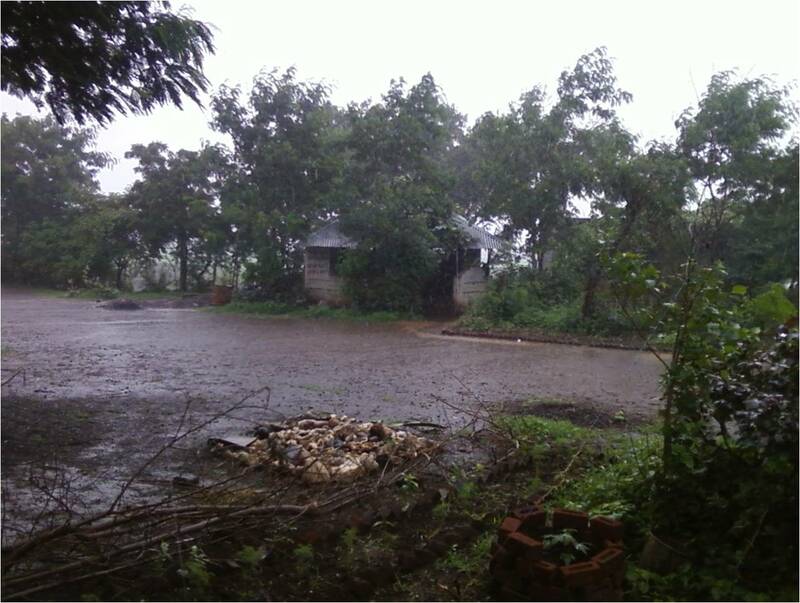 During the monsoons, rain and water are natural themes for discussion in the science class. Different groups did a variety of projects based on the theme - Rain. Two groups made instruments to measure rain and kept a record of the daily rainfall. 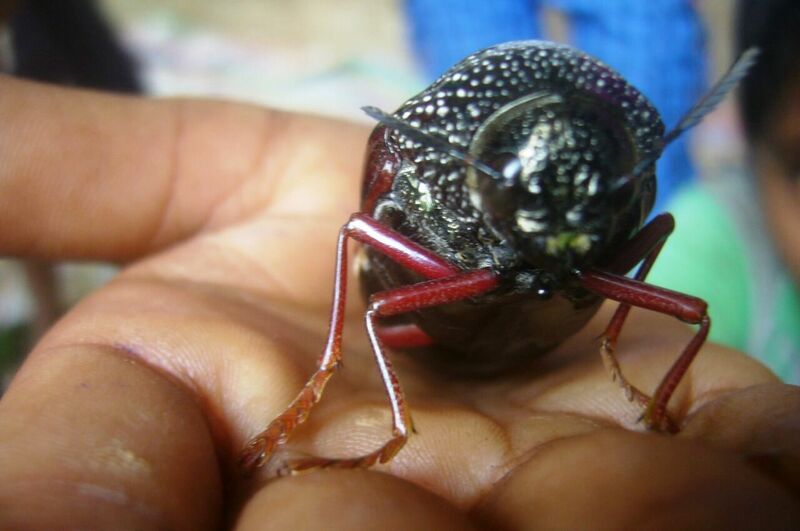 Some children observed insects of their own interest and some learnt to make Jeevamrut and organic pesticide. Different groups record some daily observations, like – temperature, birds, sunrise, sunset, and diet etc. - a part of the science curriculum. 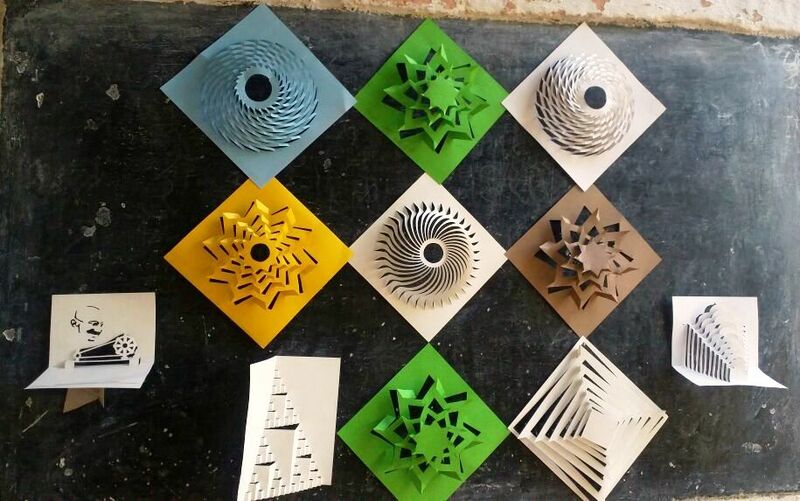 Art, craft and singing are also routine activities of the day. Mask making from waste paper and mud, and soft board making from waste paper which helped children to understand the concept of zero waste. We are trying to make recycling into a regular activity by incorporating a Recycling Day in the time table besides using waste material for craft activities. Conducted training to make mufflers, woollen caps, ear bands, hand bands, and bags from waste plastic. Importance was given to develop psychomotor skill of children. 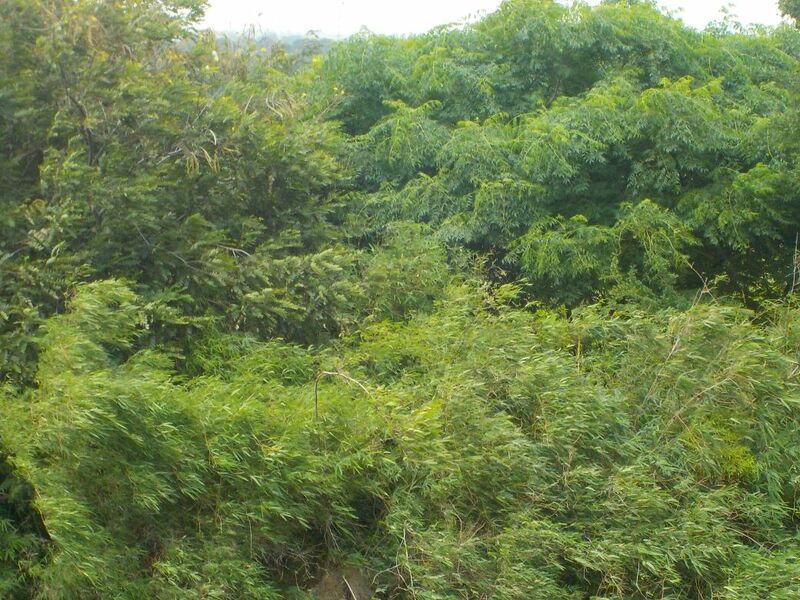 Children interviewed elders to identify medicinal plants in their area. According to the information collected from elders, children planted medicinal plants in small herbs gardens. Children also identified 120 edible wild leaf vegetables around Adharshila and surrounding and also made gardens. We routinely put these 'wild' plant leaves in the daal and we know that they are not to be removed while weeding. Origami and Kirigami workshops were also held this year. A workshop to learn to repair the spinning wheel was held. Group activity was organized to understand how much fuel is being used in hostel mess and children also discussed how to reduce the expense for fuel and concept of clean fuel. Conducted debate on Samoohik Vivah following Hindu marriage ceremony being propagated by government. Conducted discussion on adivasi culture, struggle to retain culture and process of sanskritization being pushed by government and other religious forces. Painting competition was organized, 120 children participated. Thanks to our well wisher, Vibhor who brought two laptops and agreed to install the politically incorrect windows as there are hardly any politically correct computer nerds in Sendhwa, the middle school children learnt some basics of computers and Hindi typing. Hopefully this year they will take these skills forward and will be able to do some real work like documentation, slide shows etc. Premchand Jayanti - Although reading books from the library is a routine feature but Premchand Jayanti gives an opportunity to focus on the theme of storytelling. Children wrote and narrated stories in class - folk, self written and from the library. The children also wrote essays on various topics. A special assembly was held where the teachers told the children about the style and contribution of Premchand in Hindi Literature. Chandrashekhar Azad Jayanti - was also celebrated where children read his life story and made his sketch. Independence Day - Parts of the film, Bharat Ek Khoj by Shyam Benegal were shown besides the regular function where children sang patriotic songs and did skits based on the theme of Independence struggle. The flag hoisting is always done by important local people. This year the village patel was invited. He is a traditional healer and known to be a good person in the village. Sharaab Mukti Diwas – Discussion followed by essay writing on use of alcohol in the village and problems created by its abuse. Teachers Day was celebrated on 5th September. Sports festival - apart from in-door and out-door games, school organized fun games for both children and teachers. One of the main reasons for starting Adharshila, an adivasi school was to inculcate a sense of pride in the children about their culture and history and to keep them connected to the various peoples’ struggles. 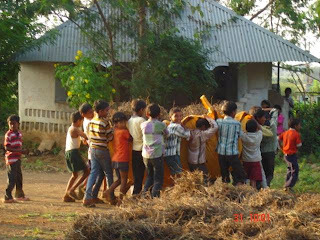 We feel this is important to develop self esteem and confidence in the adivasi children. Singing of folk songs, celebrating local festivals, telling and documenting folk stories, talking in the local language even during class all these activities are encouraged and are part of the school curriculum. Middle school children went to two local markets –Sendhwa and Palsood for four days and interviewed Shop keepers, farmers and wage labours to understand the impact of demonetization on market, agriculture and common man. After that there was a discussion on demonetisation’s reason and effects. Children also wrote essays on the same topic. 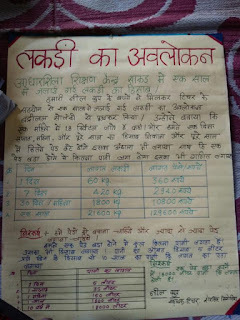 One social intervention project to figure out ways of reducing fuel wood usage for which the children calculated the fuel wood expenditure in the school mess. Children’s theatre group (Naatak India Company) performed a play Two Wheels of a Cart about the problems of Adivasi women in Mahila Samelan, organized by Jagrut Adivasi Dalit Sangathan in Pati block of the district. To give children and teachers an exposure about the adivasi cultural movement in the country, 20 children and 4 teachers participated in Vishwa Adivasi Divas function (World Indigenous day) held in Barwani, the district head-quarters. While children performed the dance based on the song Gaon Chhodab Nahi. They were awarded Rs 2000 by viewers for encouragement. Teachers Majli and Sher Singh got a chance to give a speech in front of a big audience. Two ex students participated in the National Adivasi Rally and cultural programme held in Delhi in September. An ex student, Suresh Dudwe got admission for PhD, Hindi Literature, in the Tamil Nadu Central University. Vijay Kharte, who did ITI after 10th from Indore, got a job in Dubai. Two ex-students are taking active part in the Adivasi Mukti Sangathan, while working on their farms. Vijay, passed 10th with 85% from Excellence School, Barwani and has been selected to study in Indore. Vaibhav (Ashoka Fellow) came to see the work of children and presently he is helping the organization in documenting the curriculum. Vibhore (Phd scholar from US) came for a week and brought two laptops .Children is learning typing and also watch films related to curriculum. Shwetha (TISS, Hyderbad) came for 15 days took English class while writing a report for her project. Two groups from two NGO working in the field of education have visited to observe the teaching practices in Adharshila. One was a team from Shivpur district who runs school for children of Paardi tribe who have been displaced has visited Adharshila. Three day workshop on education was conducted with them. The other team was from Ekalavya working in Tamiya block, Chindwara district also came for two days .Workshop was organized on project based learning. Both the schools have started some activities and projects in their institution which they learned from Adharshila. Teachers and supervisors from Eklavya came for three days .Children showed them school and work done over the years by putting up an exhibition. Two Trustee Meetings were held this term to sort out administrative problems. All these years the trustees were passive observers. This year we thought of involving them in the growth of the school. It was decided to continue this practice. Right from it’s inception it was decided that Adharshila will not take institutional funding for running costs. For the last 19 years we have been standing by this resolve. Barring two major costs of purchasing the land and building a pucca library we have not taken institutional funding. All the rooms and equipment have come from the funds raised from parents, local community and friends or through the work and theatre of children. We are trying to raise vegetables, milk and pulses and fuel wood from the six acre plot of land. Organization funded by the community. About 60% expense is raised through local contributions. The rest are raised through donations from friends or through sponsorships @ Rs. 10,000/year/child. Some funds are raised through crafts made by children and by staging plays prepared by Naatak India Company in mass programmes. Volunteers also help in teaching regular classes and to take special workshops like origami, spinning, English speaking etc. This year some friends who helped the school financially were Sayani Dasgupta, Anjali Dhamija, Joe John, Nataasha Badwar, Autar Kaul, Raj Dulari Kaul and Sanjeevani Wanchu, R. Ravi and S. Srinivasan. The Veer Khajiya Naik Manav Vikas Pratishthan was set up in 1997 to promote the all round development of adivasi society. The main focus of its work until now has been in the fields of education, organic farming and youth awareness. The VKNMV Pratishthan is registered under the Societies Act and Sec 12A of the Income Tax Act. We are inviting volunteer and Teacher Fellowship applications for the session of 2017 - 18. You qualify for a Teacher Fellowship only if you spend one full term – 3 months – or more at Adharshila. (The term is slightly shorter than 3 months but you will be expected to prepare for the term and write lesson plans based on your teaching experience in the remaining time.) For this you get a small stipend, food from the mess and a shared space on the campus. For shorter periods you are a volunteer for which you don’t get a stipend, just food and lodging. 2. Term 3: January 2018-April 2018. Expectations – As a volunteer you will be required to assist in the regular subject classes. In the remaining time you will be expected to help in office, farm, mess, engaging students who need extra help or any other activity where there is a need. If you have some special skills like art, music, dance, craft etc. then you can do these regularly for the time you are there or in a workshop mode. As a Teacher Fellow also, you have to do the above tasks. But as your period of stay is longer you can choose to do a project of your choice on your own or by engaging children/teachers with you, in addition to the regular work. In both cases we will try to fit your skill set with the tasks. The going at Adharshila is tough if you have never stayed in a rural setting. So be prepared. 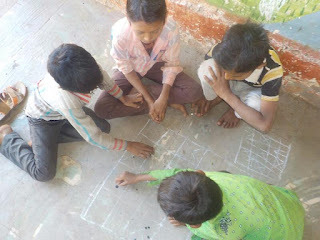 A brief report of activities at Adharshila Learning Centre in the first three months of the new session. We have only written about the activities that took place outside the regular class room study. Please read, give ideas, and share with friends. Volunteer to implement your ideas.